Back at Sewing Summit, I won some 1" Thangles from Amanda over at Hey Porkchop! during her mini quilts class. They sat unused until just about two weeks ago when I finally decided to break them out. Totally unintentional, but I love how the design is reflected in the Coke can. I used all my favorite Art Gallery Pure Elements colors. The current size for this little guy is 15.5" x 16.5" Can I tell you how excited I was when I measured and realized my seams were right on?! I'm unsure how I want to finish this up. It could be part of a quilt, a pillow, a wall quilt. I've even thought about framing it. I pretty much love it. 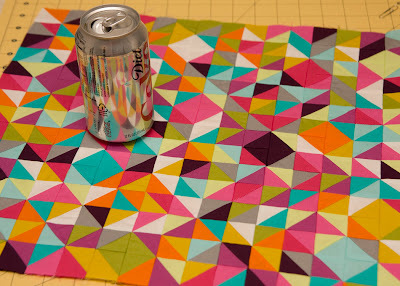 My arrangement was totally inspired by this fabulous quilt from Sew Katie Did. 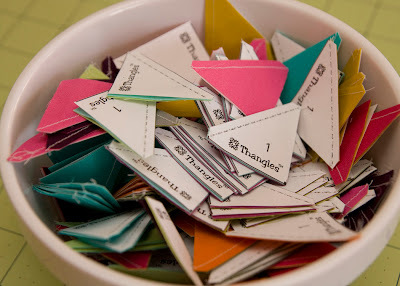 I'm not sure I'd use Thangles for bigger HSTs, but they definitely made life a bit easier when making these tiny little guys. Thanks Amanda for the pack of Thangles! I had a lot of fun trying them out. Looks stunning. Totally understand your enthusiasm. I think this would make a perfect pillow or wall hanging. I love the solids. You certainly need thangles for hst's that small. Just curious...do you cut the fabric before or after you sew? and why wouldn't you use it for larger ones? Thanks for some pointers. Beautiful! Love the addition of the 'squares' you added! This looks really awesome! I've never tried Thangles, but I'd like to! Gorgeous! I love those colors together and the randomness of the pattern! Oh wow Kati! This looks fabulous!! Wow! I would absolutely make this a wall hanging - & put it somewhere you will see it all the time! :) Very cool! Spectacular colors and layout. I'm a thangle kind of gal myself. How do you get it all done?! Your quilt is beautiful. 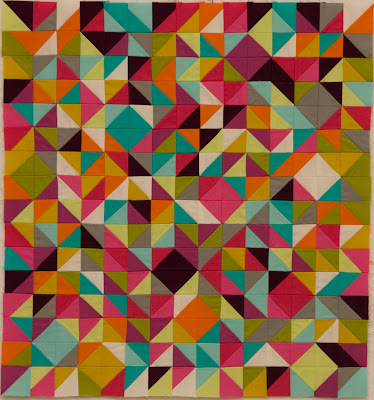 I was so jealous that you have showed three fantastic quilts in what feels like a minute (aka January). Then I scrolled down and saw the how tiny the HST's are and I almost died. That is really awesome!!! I need those little buggars! OMG! Those are so tiny!! Maybe a notebook cover? What a pretty piece! Whether to use Thangles or not, you've sure convinced me about using Pure Elements in quilts. They're quite gorgeous. I've never used thangles, they just seemed so gimmicky, but that quilt is proof that they make a difference, at least for tiny triangles. And the color combination is insanely gorgeous! I love the random little diamonds! Very nice and way cute! Absolutely gorgeous! I love that color combo. And the design is so beautiful. Well done! It is a work of art. that Amanda... she's a paper piecing genius! Kati, I'm in awe..... those are some itty bitty triangles! The way you've arranged them is brilliant!!!! Holy cow this is awesome! I love me some Thangles. Really pretty Kati - impressed, very! Awesome! I love how this turned out! I can't wait to see what you use it for! 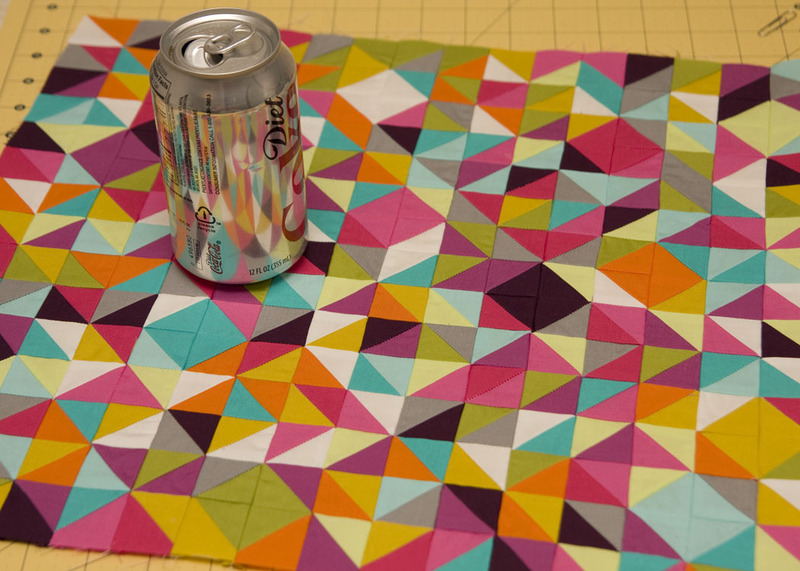 Have you seen this tutorial for making HST? It looks SUPER easy.. Can't wait to try it. p.s. - that's not my blog, not trying to promote it or anything - just thought it looked like a cool way to do it. I love this arrangement. Are the squares intentional? Love them. Yay for happy points! I heard these were great for swaps- lots of consistency. Stunning - love the saturated colours !! Wow, fabulous colours and design! I love the one dark diamond.